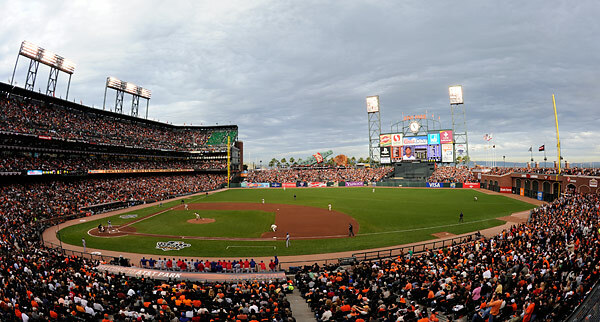 My assignment covering the 2010 World Series for Major League Baseball Photos continued Thursday night at A,T&T Park in San Francisco as the Rangers looked to get even with the Giants. The MLB Photo team of me, Brad Mangin, Rich Pilling and editor Jessica Foster arrived at the ballpark 5 hours before first pitch. We were all hoping that the Rangers could even things up at one game a piece before heading to Dallas for the weekend. Well, perhaps not Brad, who is a die hard Giants fan and season ticket holder! 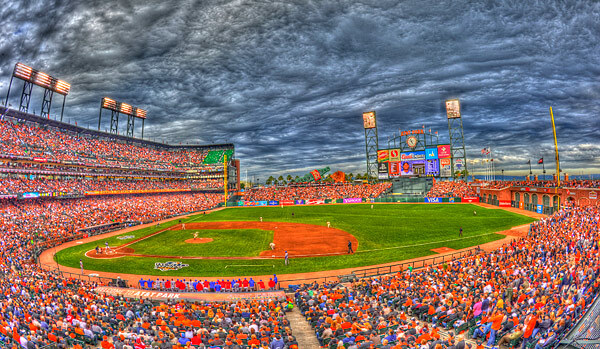 The weather forecast was questionable as showers were predicted to arrive around game time in the Bay Area. Even though clouds moved in early in the day, things remained dry as pregame wound down and preparations were made for a scheduled 4:57pm first pitch. The combination of clouds and approaching sunset made for some interesting skies as game time approached. The conditions were perfect for shooting in HDRI (high dynamic range imaging) mode. I have been playing around with HDRI the past few weeks, and really love all options it offers. While HDRI has become a controversial topic among photographers, I personally think it is just another cool tool from the digital darkroom. The effects of HDRI are most noticeable the wider the exposure latitude is. 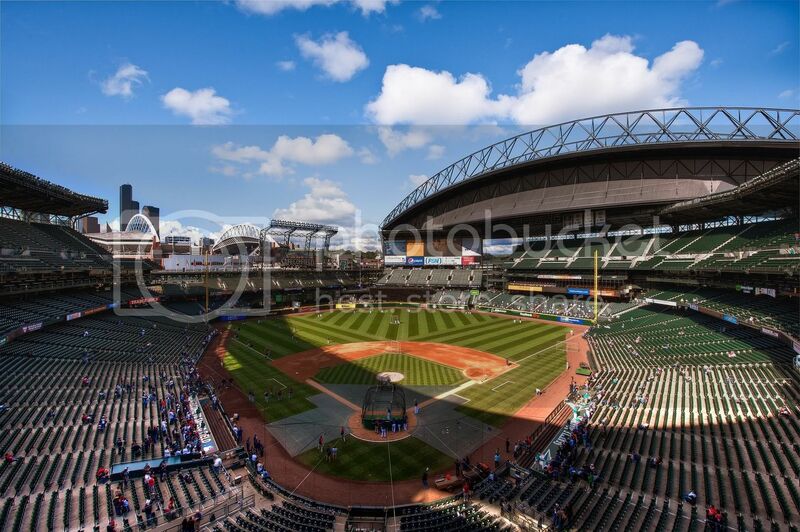 I was hoping that the sun would stay out for the actual first pitch as pictured earlier, but no such luck. The various effects that can be applied while thinking HDRI, especially when compared side-by-side to the same image captured traditionally is quite dramatic. After the first pitch, that was it for the day’s experimentation with HDRI. It was time to put down my wide angle lens and grab my trusty Nikon 500 f4 VR and get back to covering the game, tonight from the overhang overlooking the Rangers dugout along the first base line. 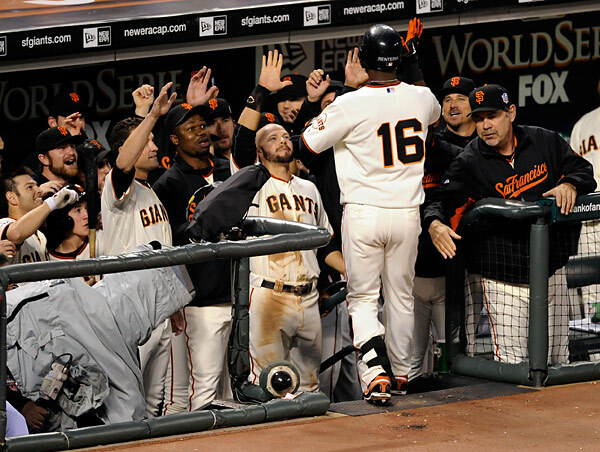 Cody Ross slides home safely during the Giants 7 run eighth inning during Game 2 of the 2010 World Series. © Ron Vesely/MLB Photos. I love shooting from an elevated position. Rarely blocked, I can see everything that is going on. 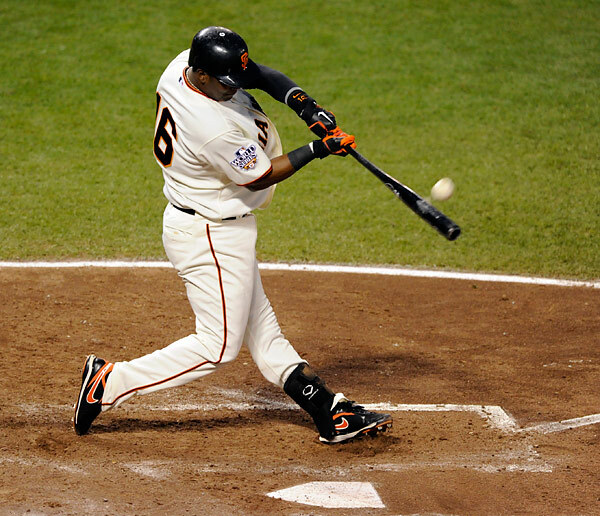 It is the “up man’s” responsibility to swing with the action, where ever it is on the field. That way, the field level photographers can take a few more risks, photo wise, and not have to worry about “the team” coming up short should a big play occur. 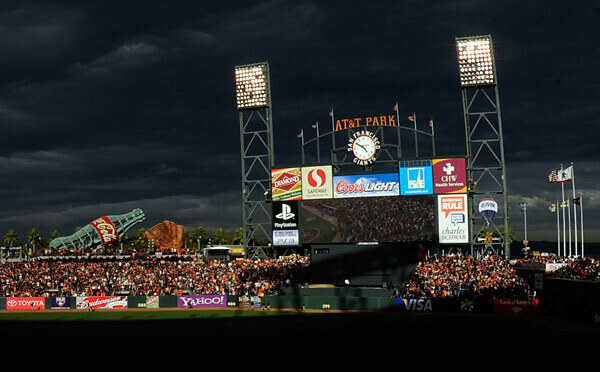 With the game locked up in a 0-0 tie in the fifth inning, Giants shortstop Edgar Renteria broke the scoreless duel when he hit a solo home run off of Rangers starter C.J. Wilson. 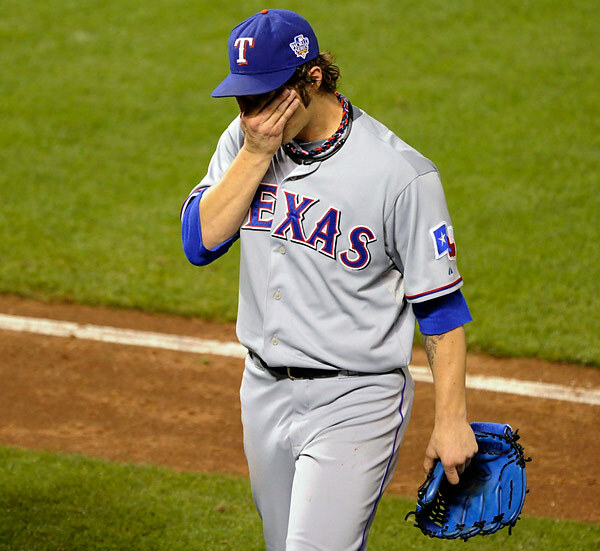 The game remained close through the 7th, when Rangers starter C.J. Wilson had to come out of the game due to injury. The Rangers started the eighth inning in promising fashion as Elvis Andrus stole second base with one out. 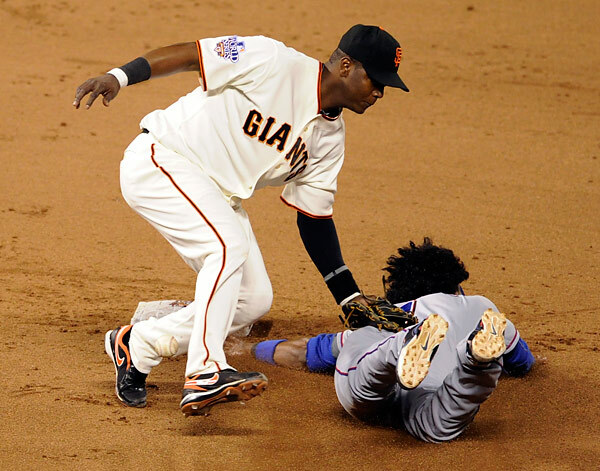 But the Rangers could not get the big hit and left yet another runner stranded in scoring position. In the bottom of the 8th, the Rangers bullpen couldn’t find the strike zone and the Giants blew the game open with a 7 run inning. Ex-White Sox 2005 World Series hero Aaron Rowand even got into the act when he hit a pinch hit, 2 run triple as the Giants sent 10 batters to the plate. 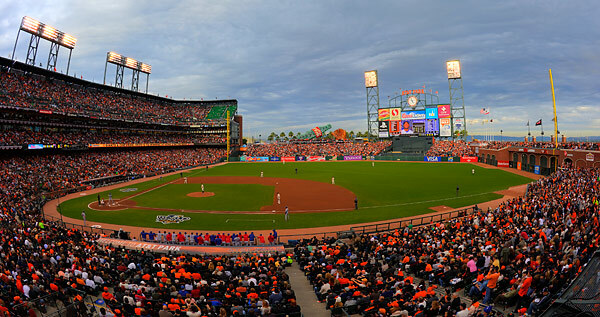 Quickly, what was a tight, two-run ballgame (Giants closer Brian Wilson was warming up when the 8th inning began) became a 9-0 route as the Giants took a 2 game to 0 lead in the 2010 World Series. Matt Cain was spectacular all night, keeping the Rangers off balance while making the big pitches when he had too all night long. I headed back to the hotel for a quick nap then grabbed a cab to the airport at 3:30am (my ticket somehow got messed up and I lost my seat assignment on what became an extremely over sold flight to Dallas… lucky me) for a 7:15 am flight to Dallas. I’m hoping the Rangers get back in it Saturday night. With Nolan Ryan scheduled to throw out the ceremonial first pitch, The Ballpark at Arlington should be rocking. Get your chores done early and be sure to tune in for the 5:57 central time first pitch. This entry was posted on Saturday, October 30th, 2010 at 12:27 PM	and is filed under Assignments. You can follow any responses to this entry through the RSS 2.0 feed. 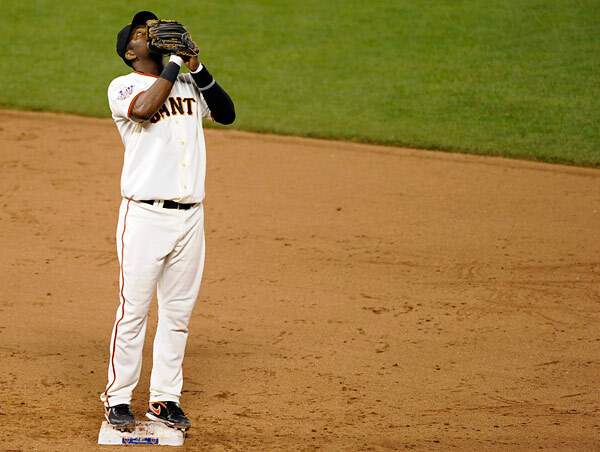 Thanks for sharing the great images from the World Series so far. I found it interesting that you like to play around with HDR. I know a lot of people really don’t like it in the photography community, but I find it interesting. 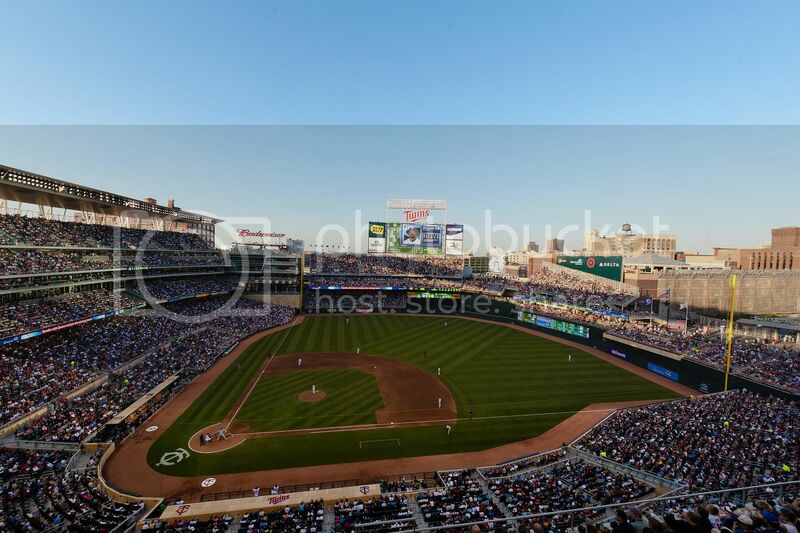 I similarly took an HDR image of the Minnesota Twins’ new ballpark, Target Field, earlier this summer just before the 4th of July. 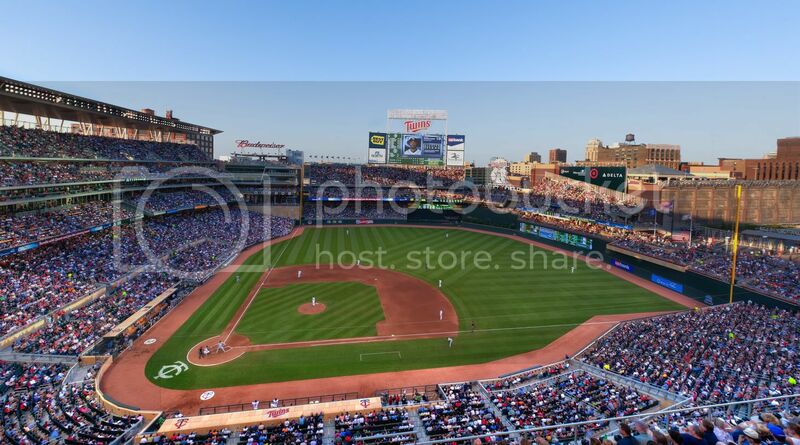 Here are direct links to the HDR image and the conventional counterpart of the same image if you’re interested. The reason the area behind the visitor’s dugout (left side) is lit up is because of the sunlight bouncing off one of the buildings downtown. HDR is fun, but it takes a lot of effort to really get it to look “right”. A lot of my best efforts still come up a bit short though. I think that one is a combination of 5 exposures. Just imagine that when the image was exposed just for the light areas the shadows were almost completely black. So the HDR really opened the image up a lot and I like how it turned out.